But what exactly does that mean? And as a vacation rental host, why should you care? Here are the basics on “Airbnb Plus,” why it matters for you as a host, and how you can score the newly-coveted title. What is “Airbnb Plus”, anyway? According to Airbnb, vacation rentals that qualify as “Airbnb Plus” rentals meet “the high standards set for quality and comfort.” Roughly translated, that means homes approved for the “plus” list are, for starters, above average: They’re likely in a higher price range and offer many of the amenities someone might expect or actually have in their own home. The idea, essentially, is that “Airbnb Plus” rentals are the “first class” of Airbnb listings. Airbnb already has the “Superhost” program, which is geared towards the host. The “Plus” program is Airbnb’s way of grading the property as well and providing a ranking for that. As sites like Airbnb became more popular, it became harder and harder to appear unique in a sea of vacation rentals. It was a challenge to stand out and getting there required an additional investment of time (and often, money). Getting branded with a “plus” is like money in your pocket. According to Airbnb’s research, 73% of travelers are willing to pay more for a quality, comfortable place to stay. Ultimately, that means more bookings and higher revenue. “Airbnb Plus” in LA: What Can You Do to Make the Cut? 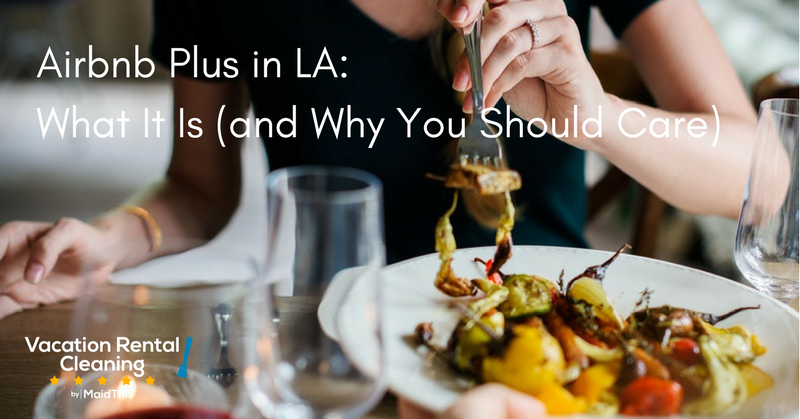 Los Angeles is one of 13 international cities where Airbnb has launched the “Plus” program, so, yes! You can achieve Airbnb greatness. Getting the stamp of approval is tough, however. These homes are graded on a 100-point checklist covering 4 main categories: Thoughtfully Designed, Comfort, Well-Equipped, and Well-Maintained. Airbnb wants to know that your place is, above all, comfortable, immaculately maintained and kept clean, and incorporates a cohesive design. A rep from Airbnb actually physically comes to your place to scope it out and “grade” it. Nothing is based on pictures and hearsay. It’s all seen and verified by an Airbnb staffer. All approved hosts have approval ratings of 4.8 or higher. Hosts are expected to maintain their ratings, too. Approved hosts are dependable. “Airbnb Plus” hosts accept 95% of booking requests and haven’t canceled on a guest at all in the last 12 months. Hosts aren’t approved for free. There’s a nonrefundable $149 application fee. Whether you make the cut or not, you’ll still get some valuable feedback on how to improve your vacation rental and try again or simply to improve the comfort of your guests. So….is it worth the hassle for you? It really depends on what type of property you want to pitch and how buttoned up your operations are. If you go through the hassle of getting “Airbnb Plus” certification, will you be able to sustain it? Make no mistake, there is heightened pressure to make your listing the best possible. Guest expectations will be higher for any property that is on the “Airbnb Plus” program. BUT, you’re definitely going to get more business from this. The MaidThis! Opinion: In short, yes it’s worth going for this accolade. As people have started to discover that they can make money by listing their place on Airbnb, the supply of homes (especially in large cities like LA, SF, NY, etc.) is skyrocketing – meaning way more competition than before! You need some sort of competitive advantage to ensure your home isn’t just a commodity (think low rates), and the “Airbnb Plus” program is one possible avenue to make yourself stand out more against the competition. If you think you’re ready to be graded, head over to Airbnb’s host signup page. “Airbnb Plus” is the new “super host” and if you want a spot on the list, you’re going to have to truly go above and beyond to demonstrate to both Airbnb and your guests that you’ve got a stellar place to stay. But rest assured, all that hard work will definitely pay off. If you plan to apply for “Airbnb Plus,” we wish you the best of luck! Part of earning the “Airbnb Plus” badge of approval is maintaining an impeccably clean home. MaidThis! Specializes in Airbnb turnover cleanings for vacation rentals in LA, Orange County, and San Francisco. Learn more about how we can help you achieve “Plus” greatness.